Alistair McGowan is a leading comedy impressionist and actor. McGowan is probably best known to British audiences for The Big Impression which was, for four years (and 30 shows), one of BBC1’s top-rating comedy programmes – winning numerous awards, including a BAFTA in 2003. Obsessed with the art of impressions, he constantly updates his ‘voices’ – and is admired for his impressions of sports stars, TV stars and political figures alike. His act features the voices of everyone from Gary Barlow to Robbie Savage, from Boris Johnson to David Beckham – all done with uncanny accuracy. 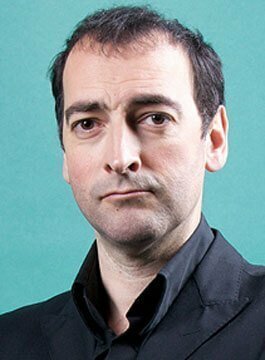 After graduating from the Guildhall School of Music and Drama in 1989, Alistair McGowan began working as a stand-up comic and was soon a regular at London’s famous Comedy Store as well as making several appearances at The Edinburgh Festival and on The Royal Variety Show. For many years he provided the voices for many of the characters on Spitting Image, including: Tony Blair, Chris Eubank, Prince Charles and Hugh Grant. His interest in sport saw him release two comedy football videos which became cult-viewing in the nineties: Football Backchat and The Second Leg. 2009 saw him return to stand-up and embark on his first solo National tour – ‘The One and Many…’ and his ‘comeback’ was complete when he appeared on Live At the Apollo. In 2010, he revived his interest in voicing-over sports footage in ITV4’s cult hit Sports Mash. In 2012, Alistair hosted You Cannot Be Serious! a peak-time topical sports show featuring a mix of clips, sketches and impressions. A season actor, he has most recently been playing the title role in Jonathan Maitland’s play, An Audience With Jimmy Savile. In 2014, he played Professor Henry Higgins in a 16-week theatre tour – alongside Jamie Foreman as Doolittle and Rula Lenska as Mrs Higgins. He has worked in theatre throughout his career and has appeared in the West End in Art, as The Emcee in Cabaret, the Mikado in The Mikado, Henry Higgins in Pygmalion and The Dentist in Little Shop of Horrors (for which he received an Olivier nomination). A keen environmentalist, Alistair has never yet owned a car and is an ambassador for WWF-UK.